YouTube - Bill Maher about Sarah Palin. What do you tell people when they ask what you do? I've most recently answered that I am a Web Developer. For some strange reason this leads them to ask: "Hey, can you fix my email?" I usually just answer with "um, no." and change the subject. I've got a couple of easier answers these days. I'll occasionally tell them I'm a blogger, but that gets strange looks, and or the above mentioned email question. The most recent and certainly my favorite answer now is that I build robots. While that isn't really my job, I do get to build robots, and I have access to our lab after work and on weekends so it isn't a lie. So far only one person has asked me to fix their robot. YouTube - Shawn Johnson, Paul Hamm and Morgan Hamm Ortega Commercial. It makes her taco pop! Aside from the innuendo, this is a really bad commercial. Mythbusters draw a MONA LISA is 80 nanoseconds! YouTube - Mythbusters draw a MONA LISA is 80 nanoseconds! at NVISION. As some of you know, I also write (wrote) for a blog at lr2.com. It was a reasonably popular links blog when I cared to post a few times a day. In the last two years I have all but ignored the site, and traffic has fallen steadily as a result. Since I am already stretched to write enough content for here, and GeekDad, I have decided to re-purpose lr2.com as a short url site. I realize there are a lot of sites out there that do this, but I think there is room for one more. It should run nearly maintenance free, and eventually provide enough network traffic and ad views to help pay for my web hosting. So if you need some URLs shortened, give it a shot, and feel free to use them in your emails, IMs, and blog posts. YouTube - Evolution is NOT a ladder. The lead-up on this one is a bit annoying, but the conclusion is worth the wait. YouTube - This is why you dont show off. lovely custom orders for an equally lovely customer! both scientists are 4 inches high. illustration boards were used for their glasses, and yarn for their hair and beards. 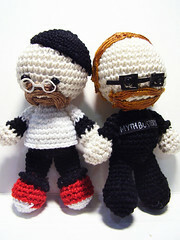 Jaime has a nonremovable beret hat and Adam has a Mythbusters t-shirt logo! Speaking of Myth Busters. The Moon Hoax expisode airs next week! YouTube - Tiger Woods 09 - Walk on Water.